Two women fight at the Park City Diner in Lancaster on Saturday, March 18, 2017. If you thought SEPTA's brawl Thursday at Race/Vine Station was bad — well, yes, it was, but this is on another level. 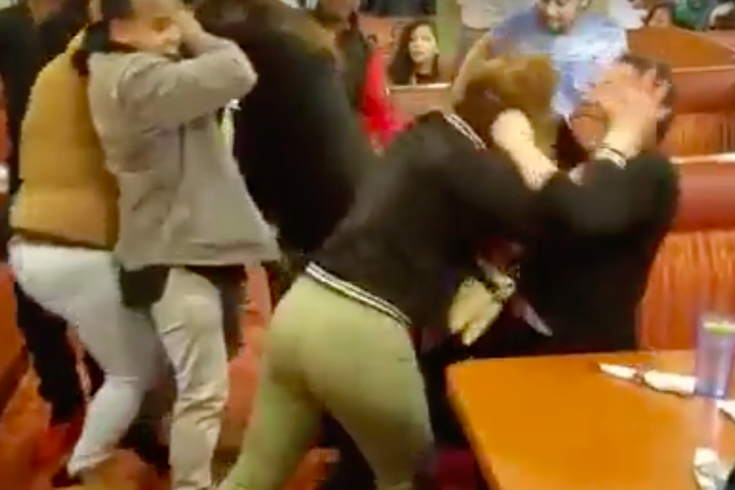 More than 868,000 people have watched the chaotic brawl that unfolded over the weekend at the Park City Diner at 884 Plaza Blvd. in Lancaster. The video, uploaded by The Realist People of Lancaster Facebook page, depicts a distasteful pummeling and lots of surrounding commotion at around 2:30 a.m. on Saturday. What kind of establishment is this? If you listen carefully, you can hear other patrons cheering on the fight. "As a manager and as a staff, we try our best to avoid any kind of problem," a Park City Diner shift manager told Lancaster Online. This was a matter of "the rowdy weekend crowd" getting out of hand and disrupting the diner's peace, she added. The shift manager went on to say she believes the fight stemmed from a domestic situation and that the two women appear to have known each other. Authorities in Manheim Township did not provide a comment on Saturday's incident pending further investigation.